A search for the enthalpy of formation of a particular compound can be a difficult task. So it is of great benefit that the values be collected together in one comprehensive compilation. Thermochemical Data and Structures of Organic Compounds presents approximately 3000 enthalpies of formation of organic compounds. There are many instances of large discrepancies reported for a particular compound. Thus, selection of the "best" value becomes a challenge for the person who is not a practicing thermochemist, but who only wishes to use the data. A critical evaluation of the values presented becomes desirable. This compilation presents about 3000 enthalpies of formation of organic compounds, all critically evaluated. "The tables of data presented in this book are a great advance in comprehensive coverage and in critical evaluation, and supersede previous tables of data. 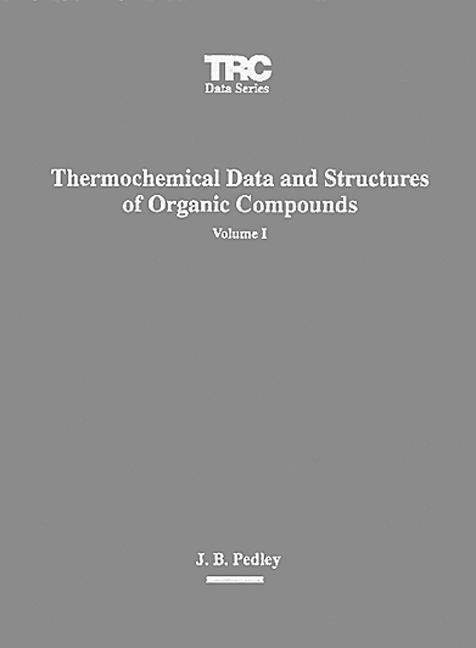 This book is the most important source of thermochemical data for organic compounds now available, and users of these tables will be grateful... for the effort and care expended in their production."